 wherEe as it hathe bene of ane olde costome that sent George should be kepte holy day thorrow alle Englond, the byshoppe of London commandyd that it shulde not be kepte, and no more it was not. The Cross of St. George was flown in 1497 by John Cabot on his voyage to discover Newfoundland and later by Sir Francis Drake and Sir Walter Raleigh. In 1620 it was the flag that was flown on the foremast of the Mayflower (with the early Union Flag combining St. George's Cross of England with St. Andrew's Saltire of Scotland on the mainmast) when the Pilgrim Fathers arrived in Plymouth, Massachusetts. 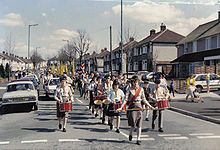 A Scout St George's Day Parade in Bristol, 1986. A traditional custom on St George's day is to wear a red rose in one's lapel, though this is no longer widely practised. The rural tradition of Pace Egg plays, which involve Saint George as the character of the "hero", is recorded in the early 17th century. 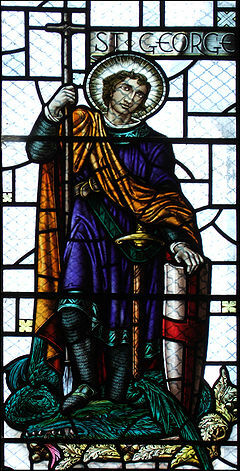 St George was selected by founder Robert Baden-Powell as the patron saint of the Scout movement and British scouting organisations such as The Scout Association continue to celebrate St George's Day. Most Scout districts host events on the Sunday closest to St George's day, often a parade and religious service for their members. On St George's Day 2002, the Campaign for an English Parliament protested at the Mayor of London Ken Livingstone's lack of support for St George's Day, while announcing plans to spend £100,000 to mark St Patrick's Day, by dyeing the fountains in Trafalgar Square red (responding to Livingtone's project of dyeing the same fountains green on St Patrick's Day). From this sprang the idea of a privately organised St George's Feast in London, the first of which was held in Covent Garden on 23 April 2003. The festival grew in size and importance during 2004 to 2008, including performances of Punch and Judy, English folk dance Mummers Players, Morris dancers, English folk music etc. The Royal Society of St George asked to contribute in the 2006 event, which was now also covered by BBC Radio 3. In early 2009, Mayor of London Boris Johnson spearheaded a campaign to encourage the celebration of St George's Day. The event was first officially held in 2010, announced as "the first Pageant of St George in 425 years". The event has since grown into a major festival centered on Trafalgar Square and organised by the Mayor of London. The Labour Leader Jeremy Corbyn also promised to make St George's day one of four new Bank Holidays in his 2017 Manifesto. ^ The Church of England (2011-04-22). "The Calendar: Rules to Order the Christian Year". Common Worship. Retrieved 2011-04-22. ^ The Church of England (2011-04-22). "The Calendar: Table of Transferences". Common Worship. Retrieved 2011-04-22. ^ The Roman Catholic Church in England and Wales (2011-04-22). "Liturgical Calendar: May 2011." Liturgy and Ordo 2010–2011. Retrieved 2011-04-22. ^ a b c d e "Religions - Christianity: Saint George". BBC. Retrieved 2012-07-26. ^ "The first step towards the promotion of St George to a position of predominance seems to be due to Edward III, who in gratitude for his supposed help at the Battle of Cregy founded the Chapel of St George at Windsor in 1348." Perrin 1922, pp. 37f. ^ "Froissart: The English in Portugal Mutiny". Nipissingu.ca. Retrieved 2012-07-26. ^ Cheney, C. R. (1964). Councils and Synods and other Documents relating to the English Church Vol. II, Part 1, 1205-1265. Oxford: Clarendon Press. pp. 101, 104. ^ it was first introduced as a minor feast day observed in the Church of England in 1222, but its omission from later lists suggests that it was not universally adopted. Perrin, p. 38. ^ "When the Prayer Book was revised under Edward VI (1547–1553), the festival of St. George was abolished, with many others. Under the influence of the Reformation the banners of his former rivals, St Edward and St Edmund, together with all other religious flags in public use, except that of St George, entirely disappeared, and their place was taken by banners containing royal badges." W. G. Perrin, British Flags, Cambridge University Press: (1922), p. 40. ^ Perrin, William Gordon (1922). British flags, their early history, and their development at sea. Cambridge University. p. 40. ^ McSmith, Andy (23 April 2009). "Who is St George?". The Independent. London. Retrieved 2010-04-23. ^ Crutchlow, Dayle (2006-07-05). "Hands off our patron saint, by George!". Coventry Telegraph. Retrieved 2008-08-17. ^ A new Patron Saint of England? (2008-06-26). "Suffolk – Community – A new Patron Saint of England?". BBC. Retrieved 2010-04-23. ^ Pageant of St George returns to London after 425 years BBC News 23 April 2010. ^ "Make St. George's Day a Public Holiday - e-petitions". Epetitions.direct.gov.uk. Retrieved 2012-07-26. ^ "An A-Z of Important Dates in British History". Information-britain.co.uk. 1992-12-03. Retrieved 2012-07-26.